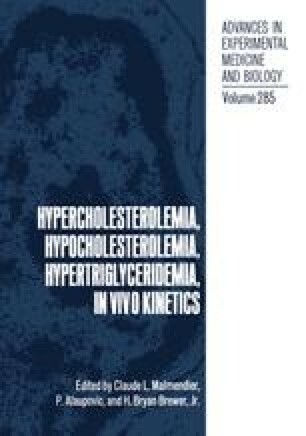 Apolipoprotein (apo) C-II plays a central role in normal triglyceride metabolism as cofactor for the enzyme lipoprotein lipase (LPL). Patients with a deficiency of either apoC-II or LPL have marked derangements in triglyceride metabolism which include an elevation of plasma triglycerides, fasting chylomicrons and VLDL (1). Clinical features of this syndrome, which is inherited as an autosomal recessive trait, include hepatosplenomegaly, eruptive xanthomas and an increased risk of pancreatitis. The diagnosis of apoC-II or LPL deficiency is established by finding a reduced post-heparin lipoprotein lipase activity which in apoC-II deficiency is corrected by the addition of normal apoC-II containing plasma.